In the aftermath of World War II, Japan’s new pacifist constitution renounced the right to wage war and maintain military forces. Instead, Japan created the Self-Defense Forces with a strictly defensive mandate. In recent years, though, the line between defense and offense has blurred. In 2004, Japan sent its Ground Self-Defense Forces to Iraq — the first deployment of Japanese soldiers in an active combat zone in over 60 years. With North Korea test-launching ballistic missiles into the Sea of Japan and China’s economic and military expansion, Japan has started reconsidering its regional strategy. Today, Japan has a $40 billion military budget, the fifth largest in the world. 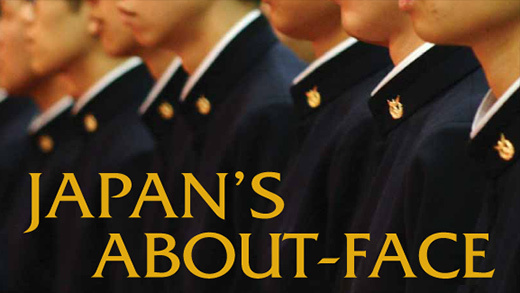 Japan’s About-Face is a remarkable window into the shifting role of the military in post-war Japanese society. I worked with filmmaker Micah Fink who had acquired unprecedented access to the National Defense Academy, Japan’s “West Point.” We followed Defense Academy cadets preparing for a future that may involve overseas deployment, and meet with a group of peace activists — some of them atom bomb survivors — on a grueling two month, 750-mile protest march from Hiroshima to Tokyo. We also witness joint maneuvers with the U.S. Marine Corps, a surveillance flight over the Sea of Japan, and the DDH Hyuga — the first Japanese aircraft carrier built since WWII. This program offers new insight into the future of Asian geopolitics.